I’m sure if you had checked my Google history when I was unwell after having my third baby ‘parenting with depression’ and similar searches would have featured heavily. I was desperate to know how others mums were managing to do it. But I could find very little written about the subject that was of any real help to me. Nothing really seemed to capture the reality of what I was experiencing. The advice wasn’t achievable. There was often an unhelpful focus on the impact maternal depression can have on children. I already knew that. I was carrying enough guilt. And some comments left on articles were so full of judgement. Being a mum to young children even when you are well and fully functioning is a really hard job. But throw in depression. It is a horrible illness. It is debilitating and devastating. I can honestly say that looking after young children whilst experiencing severe depression is hands down the most difficult thing I have ever attempted to do. In fact – I came to realise and accept that without practical help it was impossible. I wouldn’t be in the place I am now without the medical help and treatment I got from wonderful mental health professionals. But outside of appointments and behind closed doors I still had three children to care for. And I couldn’t find anything that talked honestly and realistically about how women actually cope with the practicalities of caring for children whilst they are mentally unwell. School runs, activities, cooking, mealtimes, laundry, play parks, shopping, parties, bathing, homework, housework, bike rides, bedtimes. All part and parcel of family life. This is what we do as parents. But in the depths of depression I couldn’t actually get out of bed. I couldn’t get myself showered or dressed. I couldn’t figure out how to make a cup of tea. Day to day life was terrifying and overwhelming. And for a long time I was frightened to tell anyone. To be brutally honest about just how incapacitated I was. To admit I couldn’t do it. Behind closed doors my husband took on being both mum and dad, looking after me and trying to hold down a full time job. It wasn’t sustainable. 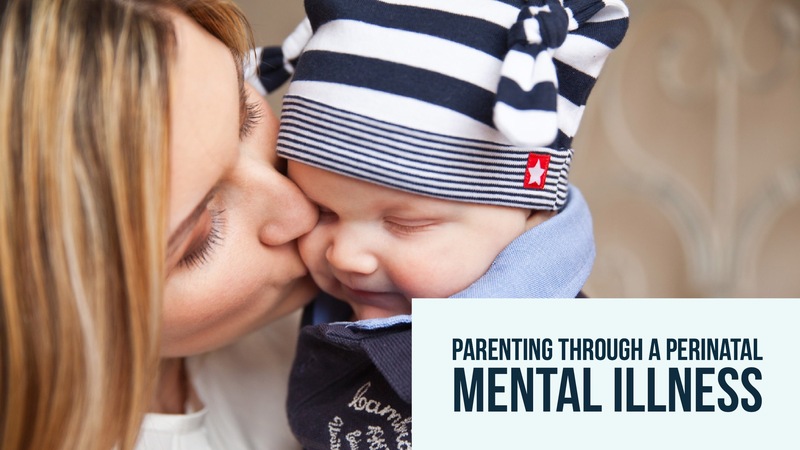 Post-natal mental illness not only affects women, it affects whole families. And ours was imploding. I was afraid to admit how much I was struggling because of fear about what people would think if I was honest. I mean what sort of mother can’t get up in the morning, feed her kids breakfast and take them to school? Maybe there was nothing wrong with me and I was just a lazy, terrible person who didn’t deserve to have three precious children. I was too ashamed. I had been an independent, capable, responsible person. I was used to doing well at things. I was a Social Worker by profession. And here I was failing miserably at being a mum. I was afraid of being totally honest with professionals for fear of having my children taken from me. Depression lies and distorts. It is from a place of being well that I can now reflect back on that time. I hope some of these reflections will help other women ask for and get the PRACTICAL help they need alongside medical treatment. It is so clear to me now that I wasn’t a lazy, useless mother. I was a mum who loved her kids very much and was trying her best but was very sick. If you are suffering you need to know that depression is REAL and it is SERIOUS. You haven’t imagined it and it is NOT laziness. It is OK to say you are struggling and to ask for practical help. When I was finally HONEST with professionals about just how much I was struggling with the practicalities of day to day life they were AMAZING. I was completely open with my health visitor and didn’t make anything look better than it was when she visited. Not once was there any concern raised about how my children were being cared for. You need to hear that if this is the worry which is stopping you from asking for help. They could see that I was a GOOD AND LOVING MUM who was UNWELL. All their energies went into helping me get better. An amazing member of the health visiting team visited me every week and helped me to put practical support in place whilst I recovered. I’ll say it again – it is absolutely OK to ASK for HELP. I wish I had asked for practical help much SOONER. My health visitor got me a nursery placement for my little boy at Midlothian Sure Start. It was an amazing place and played a huge part in my recovery. I feel so grateful to them. On really bad days they came to my home, helped me dress and feed my children and came with me to the school. All with NO JUDGEMENT – just kindness. My sister set up a volunteer from Safe Families for Children for me. A wonderful woman Isobel came and helped me twice a week at home for six months. Homelink Family Support is another organisation which provides family volunteers in Edinburgh. We were also fortunate that my husband’s employer was very understanding of mental illness and the effect it has on the whole family. When he was OPEN with them they were incredibly flexible with time off to help me. I was also eventually OPEN with my FAMILY and some close FRIENDS. And they were incredible. My parents came to stay for extended periods of time to help me. Friends also helped me out in really practical ways. One dear friend, who was in a position to, spent every Wednesday with me just helping. Don’t be afraid to TELL people close to you. And LET people help you. I also had to lower my expectation of myself as a mum and made our lives very SIMPLE. My kids didn’t do any extra activities for a long time. And they are NO worse off for it. I also received a lot of advice to ‘take one day at a time’. But a day is a very long, overwhelming period of time when you are depressed. What did really help me however was to think about the day ‘one small task at a time’. I NEVER EVER thought in a million years I would need to use any of these services or ask for this type of practical help. It took a lot of pride swallowing. But I was unwell. It could happen to anyone. It wasn’t my fault. There is no shame in it. And getting practical help alongside treatment played a huge part in my recovery and gave me the space I needed to get better. And I did get better. And I can now once again do all those things that mums just do. If you are struggling with the practicalities of being a mum in the midst of a perinatal mental illness please reach out, ask for practical help and let people help you. Please do comment if you have any other tips that may help other struggling mums. And please get in touch with us here at Juno if you would like further signposting to organisations that can help you in practical ways.